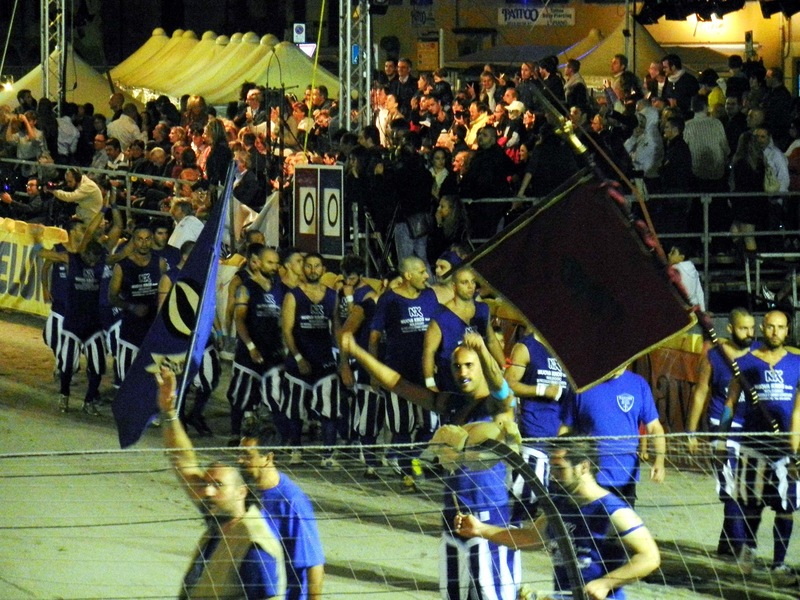 For years, I’ve been hearing about this crazy thing called “calcio storico” (historical football) that dates back to medieval times and happens once a year. 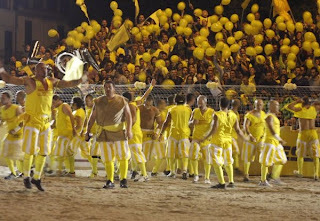 There are four teams of 25 players each, that represent the four quarters of the city and play what seems to be a mixture of soccer, football and rugby. Sounds fun, right? There’s just one tiny, little, miniscule catch. 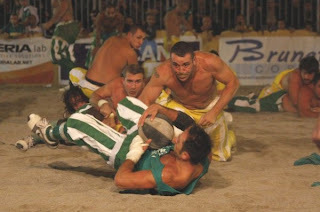 There are no rules, no substitutions and it all transpires in a giant sand pit located in a grand piazza teeming with testosterone filled men. Still want to play? Prato stopped holding the event in 1984 because it became too violent, but Florence has continued to keep the tradition year after year. 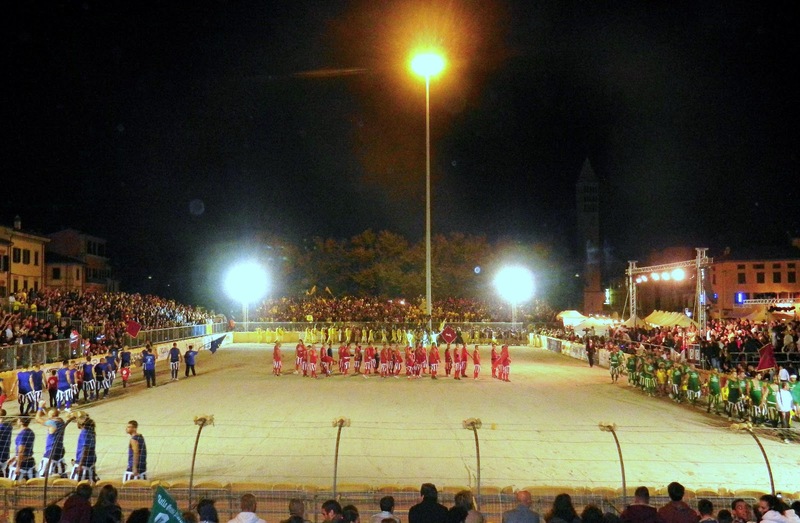 This year, Prato brought the game back and for the first time, I was able to witness it in all it’s glory. 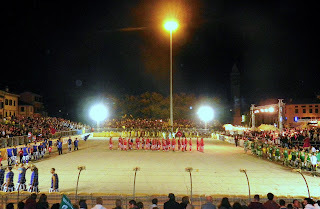 We watched the finale up close and personal this past Saturday and oh, was it a sight to see. 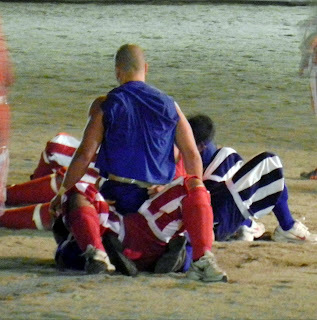 While we were watching, a friend commented that the Florentine game generally centers more so around the fighting than the playing. 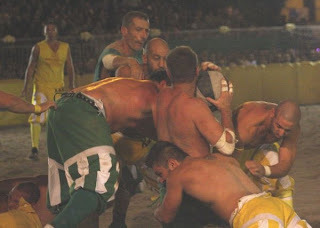 This was in contrast to the Pratese game, which, though there were times when the playing field slightly resembled a battleground, the players were definitely more focused on playing the game and gaining points than starting fights for no reason. Most likely this was the result of the 28-year hiatus for bad behavior, but it wasn’t as though the game lacked any sort of action and as a spectator I was relieved. Call me a wimp, but I don’t do blood and violence. First we watched the blue and red quarters battle it out for third and fourth place, which blue won 9-4. It was an interesting match, but hardly compared to the epic final match between the contending green and yellow quarters, which green ultimately won 4-3. 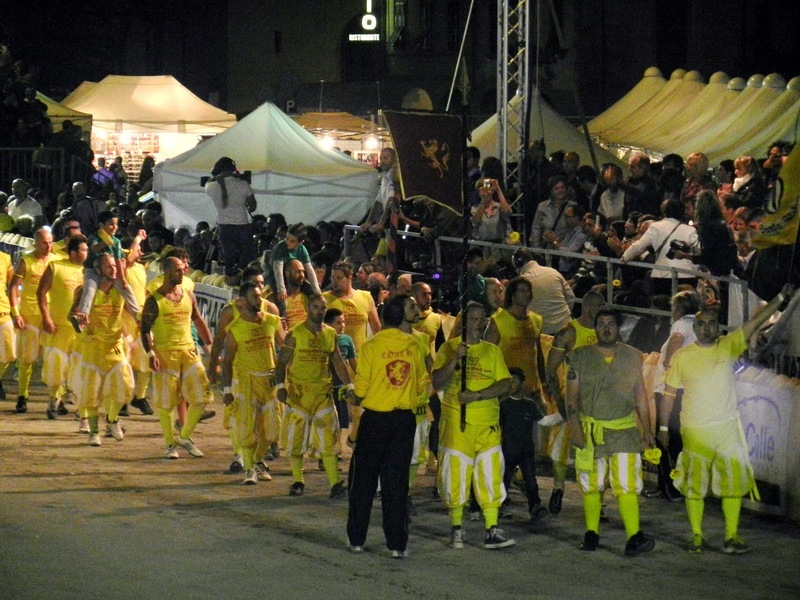 If you’re interested in getting more of an idea of what exactly goes on, visit La Palla Grossa website, watch the Pratese trailer for the event or here is a bit of propaganda for the Florentine match. 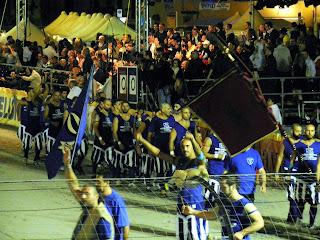 La Palla Grossa/calcio storico walks a fine line between cool and crazy, but it’s intriguing all the same. 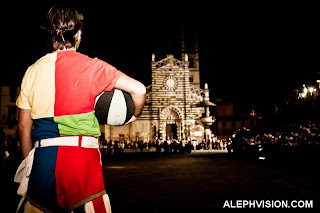 What do you think of this interesting Italian tradition?